Maybe winning or losing at the Oscars won’t make any difference to AR Rahman, as he says, but there’s something that will definitely make a big difference — the music maestro doesn’t want his children to start a career in music immediately. Rahman has three children, daughters Khatija, Rahima and son Ameen. Not many know that Rahman has already composed two tracks that were sung by his children. “I have recorded their songs and yes, they were pretty good. I liked the way they performed (Ameen sang the track NaNa from the Hollywood film, Couples Retreat and his daughter Khatija performed the track Pudhiya Manidha from Endhiran),” says Rahman. Currently it’s A R Ameen who’s being talked about for his Hollywood debut. “It was an unexpected thing, but he did a good job.He is a keen listener and he has a lot of (musical) qualities in him,” says the doting father who’s in the Oscar race in two categories for Danny Boyle’s 127 Hours. Even though Ameen has now made his big debut in a Hollywood film under his father, it is unlikely that the audience will get to see him more. “I think that it is too early for him to start a career in music. He is too young. It is time for him to concentrate on his academics first. 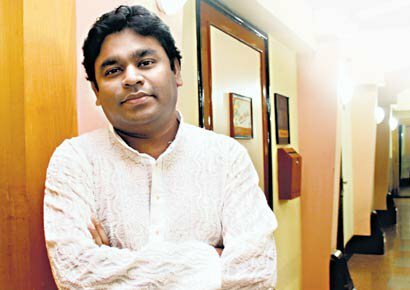 Once he finishes off his studies, then he can choose his career,” says Rahman, ruling out a regular career for his son unlike so many child artistes in India. Talking about the Oscar race, Rahman says that he will be happy if he finally wins an Oscar,but says that he is not exactly waiting for it with bated breadth. “The next film that I will be doing is Rockstar (Ranbir Kapoor-Nargis Fakhri starrer). It is important for me now to keep composing without getting stressed with the number of projects that I have in hand. I have decided that new projects would only come in once I finish what I have in hand,” he says. AR Rahman was bestowed with the Crystal Award at the opening ceremony of the World Economic Forum (WEF) at Davos on Thursday. The award is given annually by the WEF to outstanding artists who use their talent not only for their own profession but also for social and charitable work.